K-pop (and K-pop stars), K-dramas, affordable cars from Kia and Hyundai--we've got a lot of cultural and industrial imports from Korea that we can be glad about. But personally, what I'm happiest about is the food, especially the barbecue. I can't say that I've had a lot of experience with Korean barbecue, but my experiences thus far have been all to the good. However, the Bistro Group's Bulgogi Brothers wasn't one of the restaurants I'd really gotten a full experience of. So when I learned about the new items on the Bulgogi Brothers menu--their Barbecue Special--and that the Kristn.com team was invited to try some of them out, it made the perfect excuse to visit the restaurant. We headed for the branch at Greenbelt 5. The decor screamed modern Asian, with lots of dark chocolate brown furniture that would have made the restaurant seem a little gloomy had it not been for the bright lights overhead, the sunshine streaming in from the glass windows, and the smiling, helpful-without-hovering staff. The first of the dishes to arrive were side dishes that came free with the new menu items. One was a plate with corn, sweet potatoes, and quail eggs. Other dishes included sweet-spicy anchovies (or dilis, if you prefer) with sesame seeds, kangkong or water spinach, kimchi, and pickled veggies. We were then shown the meat for two of the barbecue dishes we'd be trying: the Kkotgalbisal, or Boneless Beef Ribs (P450), and the Tong Samgyeopsal, or Korean Pork Belly (P245 solo, P395 to share). At Bulgogi Brothers, you can choose to cook the barbecue to your liking or ask the staff to cook it for you. While we would have been up for the challenge of grilling our own meat, more food arrived: the new Spicy Boneless Chicken (P350) and the best-selling Haemul Gungjung Mandu (P450 for six pieces, P675 for 10), which is a fried seafood dumpling with a spicy sauce. This was followed shortly thereafter by a steaming hot bowl of Kimchi-jjigae (P395 to share), or spicy kimchi stew, which was not a new item but, we were told, a must-try nevertheless. Worried that the rest of the dishes would get cold while we figured out the best way to cook the meat, we asked the staff to help us out while we got down to the business of tasting the food. Check out the gallery below to learn what we thought of each dish as well as photos of our visit to the Greenbelt 5 branch of Bulgogi Brothers. Overall, I can't say I had anything to complain about as far as the food was concerned. I was definitely stuffed by the time we were ready to go. Price-wise, I was surprised to note that most of the new dishes were more affordable than those already on the menu. Bulgogi Brothers' Barbecue Special is now available in the following branches: Alabang Town Center, Greenbelt 5, SM Mall of Asia, Harbor Point Mall in Subic, and SM Lanang Premier. Other new menu items include: LA-Style Short Ribs (Galbi, P495), which are strips of bone-in beef short-ribs ready for grilling, and the Seafood Special (P745), which comes with salmon and apahap fillets served with a lemon-butter sauce. 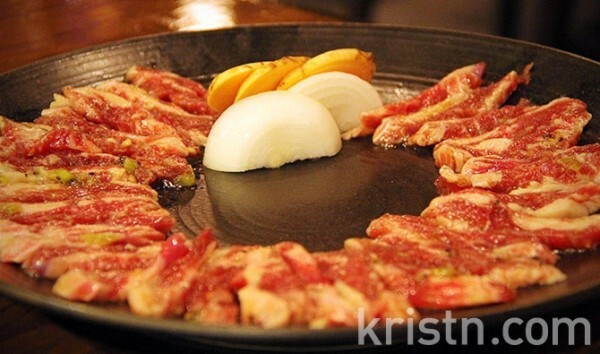 Learn more about Bulgogi Brothers by visiting their Kristn.com dining directory page or their Facebook fan page. Had a chance to dine here yourself? Click here to rate and review your experience.